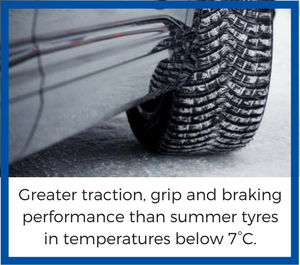 but in reality, you begin to benefit from cold weather tyres as soon as the temperature drops below 7 degrees Celsius. At ATS Euromaster, we offer a wide range of winter tyres for cars, vans and 4x4s at competitive prices to make sure you don’t get caught off guard by the changing of the seasons. We stock all major brands including Michelin, Pirelli, Goodyear & Continental winter tyres. A winter tyre is created specifically for the purpose of making sure that your car gets as much traction as possible during the cold winter months so that your car can stop as effectively as if you were driving on a dry and warm day. 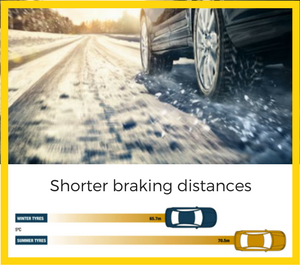 Winter tyres have deeper grooves in the tread to help the car deal with snow and increased levels of road debris, aiding traction on ice. SHOULD I FIT WINTER TYRES? Unlike a number of other countries in Europe, it is not a legal requirement to have winter tyres under UK law. 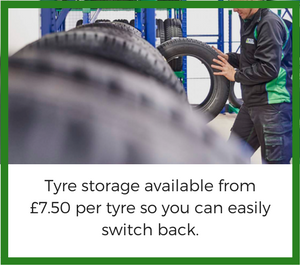 This is in part because the UK does not experience as harsh winters as other parts of the EU and even though the tyres can be beneficial, they may not be needed to the same extent as they are in other regions.